WHAT'S INSIDE 2 Argentine Giants 3 Fair Housing 3 Slurry Seal Schedule 4 Mt. Quail Cafe's 10 Years 4 New Travel ID 5 Hyw. 95 Road Work 6 Editorial 7 Drug Take Back Day 8 Council Openings 8 Earth Day 9 Salome's new bus 9 Restaurants 10 Travelogue 11 5 Star Resort Fundraiser 13 The Salvation Army 14 QIA 15 APS lowers bills 16 In Memoriam 16 AA Meetings 17 Nancy's Kitchen 17 Herb Mama 17 Arbor Day 18 Churches 20 Puzzles 22 Classifeds 22 Paul Winer's Cartoon www.DesertMessenger.com • "Quartzsite's FREE Community Paper" • 928-916-4235 WEDNESDAY, April 17, 2019 VOL. 15 # 298 Now in our 1 5 t h YEAR! Alwa y s FREE! ������ | S������ RAIN G�����-B��� Easter Egg Hunt planned Sat. 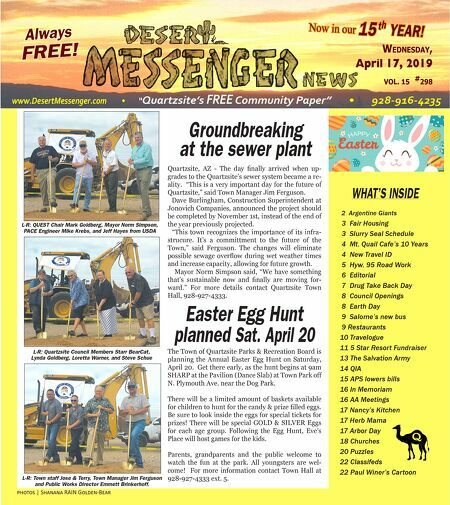 April 20 The Town of Quartzsite Parks & Recreation Board is planning the Annual Easter Egg Hunt on Saturday, April 20. Get there early, as the hunt begins at 9am SHARP at the Pavilion (Dance Slab) at Town Park off N. Plymouth Ave. near the Dog Park. There will be a limited amount of baskets available for children to hunt for the candy & prize fi lled eggs. Be sure to look inside the eggs for special tickets for prizes! There will be special GOLD & SILVER Eggs for each age group. Following the Egg Hunt, Eve's Place will host games for the kids. Parents, grandparents and the public welcome to watch the fun at the park. All youngsters are wel- come! For more information contact Town Hall at 928-927-4333 ext. 5. L-R: QUEST Chair Mark Goldberg, Mayor Norm Simpson, PACE Engineer Mike Krebs, and Jeff Hayes from USDA L-R: Quartzsite Council Members Starr BearCat, Lynda Goldberg, Loretta Warner, and Steve Schue L-R: Town staff Jose & Terry, Town Manager Jim Ferguson and Public Works Director Emmett Brinkerhoff. Groundbreaking at the sewer plant Quartzsite, AZ - The day fi nally arrived when up- grades to the Quartzsite's sewer system became a re- ality. "This is a very important day for the future of Quartzsite," said Town Manager Jim Ferguson. Dave Burlingham, Construction Superintendent at Jonovich Companies, announced the project should be completed by November 1st, instead of the end of the year previously projected. "This town recognizes the importance of its infra- strucure. It's a committment to the future of the Town," said Ferguson. The changes will eliminate possible sewage overfl ow during wet weather times and increase capacity, allowing for future growth. Mayor Norm Simpson said, "We have something that's sustainable now and fi nally are moving for- ward." For more details contact Quartzsite Town Hall, 928-927-4333.